All this talk of Convergence may be confusing if you're new to the world of DC Comics. So it's with new readers in mind that we present Convergence 101, a post breaking down the basics. We’ve been talking about Convergence for a while now, so if you have even the slightest interest in comic books, you’ve probably heard about it. It’s one of the biggest comic book events in DC Comics history, and will impact just about every title we publish, particularly over the next two months. From next week until the end of May, just about all of our regular DC Universe titles will go on hiatus and will be replaced by a collection of two-issue miniseries and one weekly Convergence comic that will serve as the “spine” of the story. These comics will revisit characters and worlds from DC’s past, some going back as far as 30-40 years, which is nothing short of awesome if you’re a long-time reader who grew up with those characters and experienced those iconic storylines as they took place. But what if you’re a new comic book fan? What if you started reading DC Comics with the start of The New 52 or even more recently? Heck, what if you’re a brand new reader who’s just about to visit your very first comic shop? Can you enjoy Convergence? Heck yeah, you can! The great thing about the Convergence comics is that they’re all pretty self-contained. You can pick up any one of the two-issue miniseries and understand and enjoy it, whether or not you’re familiar with the characters and world within it. The same goes with the weekly Convergence series. However, we thought it might still help to give you a bit of background about what the heck is actually going on. Consider this a crash course in Convergence 101. Don’t worry, there won’t be a test and your only homework is to read some comics. Don’t you wish all your classes were like this? So what do you need to know to start reading? Well, one of the great things about Convergence is that for such a massive event, it really doesn’t require much foreknowledge. There are teases of it in past comics. (There was a big one in last September’s BOOSTER GOLD: FUTURES END #1.) It’s also set up by two of our weekly comic books, THE NEW 52: FUTURES END and EARTH 2: WORLD’S END, both of which end this week. However, reading those, while helpful, isn’t necessary. 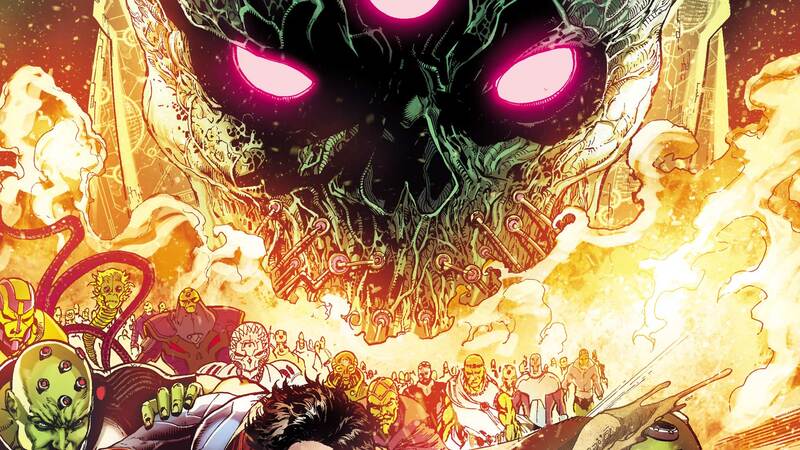 Convergence takes place on a mysterious planet that exists outside of time, which was created by Brainiac. Recently, Brainiac’s proven to be a far bigger threat to the universe than anyone could have realized, which we see in The New 52: Futures End. He’s big, he’s menacing, and he has motives that are as ominous as they are puzzling—such as creating the realm in which Convergence is set. This realm is a strange one. It's a planet, but a sentient one capable of appearing in humanoid form. We’re first introduced to it in this week’s CONVERGENCE #0, which sets up and kicks off the entire event and we discover it alongside the Man of Steel himself, who wakes up on the planet after the events of last year’s SUPERMAN: DOOMED. We don’t want to spoil too much of what’s revealed in the zero issue, but suffice it to say that the world is filled with cities from all throughout DC comic book history that Brainiac has saved from destruction moments before the end. So What are the Cities? Well, that’s actually a pretty big question and this would turn into an encyclopedia if we were to go into all of them here. However, they’re all laid out and described in the back of Convergence #0, and you can also learn about quite a few of them by scrolling over our interactive Convergence Map. What we’ll say is that the cities are all from past storylines. Some of these storylines are from alternate universe stories (often referred to as “Elseworlds” stories), some are from different worlds in the Multiverse (such as Earth-2) and some are from long-running comics such as Batman, Justice League and Action Comics, but from earlier continuities well before The New 52. Of course, if you’re confused by what we mean by the “Multiverse” and “earlier continuities,” you might want to check out this previous post about the DC’s Multiverse and Crisis events. It’ll help. However, all you really need to know is that the cities in the Convergence miniseries are NOT the cities you’ll find in the DC Comics released last month. Nor are the characters the same versions of the characters currently running in our books. They’re all from past storylines. The DC Universe is a “shared universe”—which is an insider way of saying that all of our monthly comics take place in the same world. That’s one of the things that makes monthly super hero comics so much fun, but it can also make things difficult for new readers. For example, if you only know Superman from movies and TV, you expect him to be romantically involved with Lois Lane. But that’s NOT the case in the comics, in which Superman is involved with Wonder Woman. That’s an easy enough change to wrap your head around, but over 75+ years of publishing super hero comics, these characters have gone through far more complex changes than that. Did you know that Aquaman once had long hair and only one hand? Or that at one time Batman was someone known as Jean-Paul Valley who was a former religious assassin? Or that Supergirl was once an artificial life form with shapeshifting abilities known as Matrix? All of these changes were the result of the writers and artists of the time shaking things up and reinventing the characters either to make them more reflective of the era, or just to take the comic in a direction it has never been before. It’s exciting and fun, but over long periods of time it can start to cause problems or prove to be unwieldy, especially when you have multiple books featuring the same characters. It’s one of the reasons why every now and then, DC has restarted their continuity. Continuity restarts create great starting points for new readers because you don’t need to know anything that’s taken place in a comic prior to then to understand the story. But for fans who have been reading, they can sometimes be bittersweet. After all, Barbara Gordon may be the original Batgirl historically, but to readers of a certain generation, the Batgirl they may have been first encountered might be a near-silent woman known as Cassandra Cain or a flawed daughter of a super-villain named Stephanie Brown. Change is necessary and exciting, but as readers who have seen characters they love written out of monthly comic book continuity can attest, it can be hard as well. Convergence is basically a chance to revisit these characters from the past, and reveals that none of these worlds ever truly went away. For fans familiar with them, it offers a chance to once again reacquaint themselves with these versions of the characters they love. In some cases, it may open up new story possibilities, in others it may close storylines that never got a proper finish, while others may just offer fans one last blast from the past. However, new readers don’t need to know those past storylines to enjoy Convergence. The stories don’t get bogged down in past details. In fact, the action starts pretty quickly in all of the books, and each issue #1 offers plenty of background on the main characters (such as these two pages from CONVERGENCE: HARLEY QUINN #1) to bring new readers up to speed on any details unique to that particular version of the character. Even better, to make things even easier for you, we’ll be republishing these pages right here on DCComics.com, if you’re interested in checking all of them out. In fact, we’re making a real effort to continue to educate and inform new readers about Convergence both here on the DC Comics website, in forthcoming episodes of DC All Access, and in the All Access column in the back of all our comics in the weeks ahead. We’ll be breaking down the action, and posting information that can help new readers understand these cities and heroes from the past. You’ll find links to all of the latest right on our homepage, but your best resource will be our Convergence Guide page, which you can find by clicking here. Convergence is a two-month event that features characters and cities from DC Comics’ past, but used in a fun, unique way that makes knowledge of the previous storylines unnecessary. It’ll help shape the direction of the DC Universe to come, wrap up a few loose ends, show of the writing and art of some of the best creators in comics and put some of your favorite super heroes through the challenge of their lives. It’s what everyone is going to be talking about in comic shops this spring and summer. Hopefully, now you’ll be able to join the conversation! CONVERGENCE #0 is now available everywhere in print and as a digital download.